Across the Ili river in the north-east from Almaty there is a strange mountain. People call it in different ways: the Singing Barhan, the Singing Mountain. It is made of light tones sand and against the background of the dark ridges of the Dzungarian Alatau - the Big and Small Kalkans - represents an extraordinary sight thanks to the color contrast. The sand mountain is 1,5 km long and 120 m high. The barhan is located in a peculiar passage between the Kalkans ridges. It has been formed as a result of wind activity bringing sand from the Ili banks and laying it in this place. In dry weather the sand runs down the barhan's slope, and a sound appears. Gradually it increases and sounds like a streamer hooter. A similar natural phenomenon is known in other places of the globe as well: In the Arabian Desert, on the Hawaiian Islands, in America and China. For a long time the nature of sand sounding has been a mystery. In 1962 V. Arabadzhi, a physicist from Leningrad, made a series of observations of the Singing Barhan: he recorded the sand sound, measured the temperature, strength and direction of wind, determined the sand fractions. The reason of the sand sound turned out to be its movement. When walking on the sand, the sounds remind of snow crunching, quick and strong movement causes the sound like a scream. The more is a moving mass the more expressive is the sound - from week squeak to crash. The sound appears due to other conditions as well. The biggest volume falls at the middle of the day and at the temperature of about +24°. The sounds are produced only by a dry sand mass. Having climbed one of its three peaks, one can admire the Ili river and Zailiisky Alatau ridge panorama. If the mountain keeps silence impatient visitors make it sing. For this one must quickly run down the south slope where the sand is not compressed so much. The sand jets will run from under the legs, and strong buzzing will appear form the barhan's depth. Sometimes besides sounding the barhan starts shaking. And it gives the impression of an earthquake. It is the largest high-mountain complex of winter sports in the world. It is located in the Medeo Canyon at the height of 1700m. 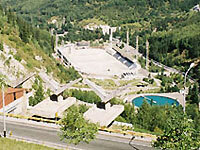 It was built in 1972 on the site of the old skating-ring with natural ice, which operated in 1950-70. The ice area square (10,5 thousand m2) allows providing of contests in the high-speed skating race, the Russian hokey, figure skating, motor-speedway and other sport and cultural measures at the skating ring. The refrigerating plants capacity can "keep" ice 8 months a year, and the skating ways - during the whole year. The special Medeo mad protection structure is located near the skating ring. 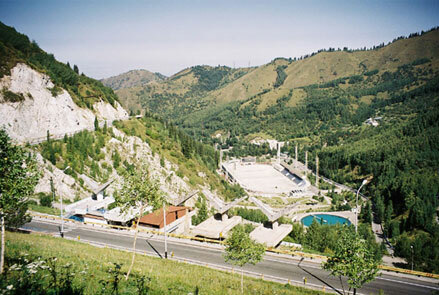 The dam construction began in 1964, according to the measures under the complex Almaty mad protection. The dam height is 150m, length - 530m, width under the base - 800m. According to calculations, it can stand for the flow of 10 million m3. The Great Canyon! No, you are not in the North America! And it is not the Colorado River! 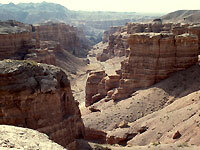 The Charyn Canyon, in many travelers' opinions is one of the most exotic places of rest. The unique landscape transfers you to the fairy-tale world of "The Castles Valley" and "The Witches' Canyon"… The canyon stretches for 154 km from the North-East to the South-West along the Charyn River. It is one of the most full-flowing rivers of the Northern Tien-Shan (193 km to the East from Almaty). That surprisingly picturesque site has the variable relief and strikes with it peculiarity. The height of the steep slopes, columns and arcs reaches 150-300 meters. The Americans, visiting Charyn, are excitingly surprised about how that local landscape is similar to the famous Grand Canyon in Arizona. Million layers of the petrified red sandstone, naked as the result of continuous wind erosion, have formed the supernatural landscape. Of special beauty are the rocky precipices, colored by the sunset. The landscape variety conditions different forms of flora and fauna. Over 1500 types of plant grow there, 17 of which are in the Red Book of the Republic of Kazakhstan and 62 species of mammals, 103 types of nestling birds and 25 types of reptiles. In spite of enjoying the un- describable nature beauty, you'll make several splendid photos and swim in the mountain river. Tamgaly - is translated, as "drawings" from the Kazakh language. 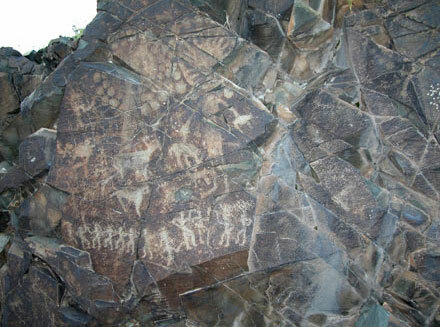 Occasionally, a unique place with petroglyphs of unknown civilization was found in the Tamgaly Canyon in the late 50-s. It was hidden in the Anrakhai Mountains 170 km to the North-West from Almaty. 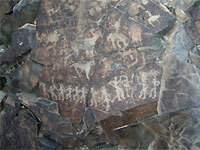 The petroglyphs gallery was hollowed three and a half thousand years ago. The mysterious civilization, lived there, disappeared, having left over 4000 drawings to us. Our mysterious ancestors showed their whole way of life and world outlook in drawings on stones. It is a true ancient art gallery, pictures of which describe both individual animals and people and the whole scenes from the ancient people's life. The wide and smooth rock surfaces have been covered with "the desert sunburn" during many centuries, having become an ideal background of that unique gallery; not one generation of the ancient masters-artists worked on it. During centuries the Tamgaly Canyon rocks and the narrow valley preserved meaning of sanctuary - i.e. places, where the ritual ceremonies were performed, magic rites, worship to gods and ancestors' spirit were provided - for different peoples, left their trace in the history of Kazakhstan. The burial grounds of the Bronze Epoch (the 9-10th centuries B.C.) and earlier nomads (the 3th century B.C. and the 2th century of our era) and their settlements are there near the canyon. Drawings of currently completely disappeared animals, such as the Przhevalskiy horse, kulan, cheetah, karakal, Tugainiy deer, aurochs of big constitution, tiger, short-legged bison, trubkozub, water goat, including one picture describing a Wild ("Snow") man's woman turned to be in Tamgaly. 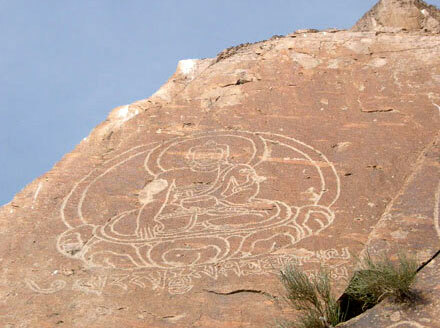 But separate place is devoted to the fantastic personages in the petroglyphs' repertory, the so-called "sun-headed". May be, they were priests, and, may be, alien guests. Only 26 drawings have been preserved up to our days. The ancient among them: figures of 40-75 centimeters, drawn in the static poses with elaborative "nimbuses", formed by different combinations of circles, circumferences, rays and points - are remarkable for their expressiveness. Very interesting are pictures of the ritual sacrifices, initiation rites (two dancing priests with two men, let into warriors), fertility cult, shots with bows, riders on horses and aurochs and many other. All drawings were made with solid stones (quartz). Not all the Tangaly monuments have been thoroughly studied; thus many questions, concerning the history of the bewitched Tamgaly place are remained without a reply for the time being. Tribes of the Bronze Epoch were the ancient residents of Tangaly, which inhabited the Kazakhstan land in the II millennium B.C. There origin is disputable. 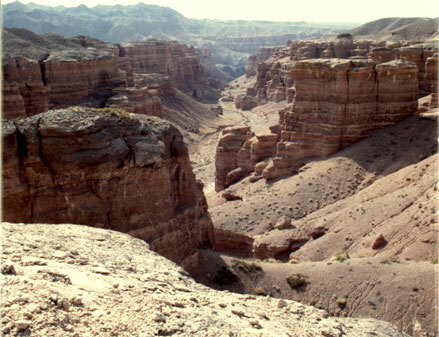 The Committee for the World Heritage made the decision at its 28th Session, held in the Chinese Suzhu since June 28 up to July 7, 2004- to include "Petrogluphs of the Archeological Tamgaly Landscape" into the UNESCO List of the World Heritage, according to the Kazakhstan proposal and taking into account Recommendations of the International Council of Monuments and Historic Places Protection (ICOMOS). The Ily River is the largest river in Semirechye. Its length is 1430 km. The river head is in the Almaty Region, it forms Kapchagai, the artificial reservoir, on its way back from China and flows into the Balkhash Lake. The river served once in antiquity, as a busy road of the Great Silk Way from the West China. Buddha looks to the sky from the big stone on the right bank many centuries. It is Tamgaly-Tas - "stones, covered with drawings". Numerous petroglyphs, expressing mysterious divinities, late Buddhists' inscriptions, essence and meaning of which are to be deciphered, have been preserved at the black rocks with sunburn. There are about 1000 rock pictures: on hunting for deer, and Buddha's images. The saint text under the pictures states in Sanskrit: "Om mane padmekhum", which means: "the Snow pearl in the lotus flower". There is another translation variant: "Let be blessing that, who was born from lotus". Inscriptions and drawings are referred by historians to the XII century. There is one more stone (not far from altar) with inscriptions in the ancient runic Turkic script of the Kipchak tribes, dated by the VIII - IX centuries. It is assumed, that they were left by the ancient Kipchak's tribes: scientists are to prove it. 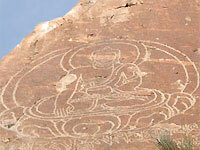 Buddhism was widely spread on the South Kazakhstan territory in the Middle Ages. 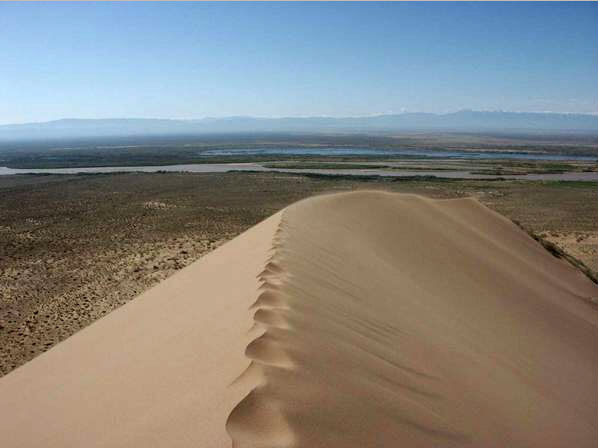 The river valley is one of the picturesque places of the Almaty region, regardless the fact, that it represents the desert and half-desert landscape. The Big Almatinskoye Lake is located high in the Big Almatinka River Canyon (at the height of 2511m above the sea level and 25 km to the South from Almaty). It is located in the cavity, as if bright mirror, surrounded by the majestic peaks from all sides. The majority of the mountain Tien-Shan lakes have appeared, as the result of earthquakes. The Big Almatinskoye Lake is the largest among such lakes. It is located at the height of 2511 m, its depth reaches 35m, length - about 1km and width - up to 500m. The water temperature is 10-120C in summer. The charming panorama of mountains with surrounding peaks is opened from the lake coast. The Sovety Peak and the Ozyorniy Peak are raised behind the lake in the South, and the rock massif of the Big Almatinskiy Peak - in the West. The lake is turned into the natural reservoir. It was formed, as the result of the ancient glassier activity. It left moraine, i.e. conglomeration of detrital rocks, detritus, stones, earth - behind it, while stepping back. Later water from melted snow filled in the formed cavity. The hydro-electric stations cascade was built in the Big Almatinskiy Canyon and the intake constructions were set up at the lake in the 50-60-s.
After the mudflow in 1977, the natural lake dam was strengthened and extended up to 8-10m. in the early 80-s, thus solving the problem of its potential destruction. The lake is very cold in winter, even its view, and it shines with the tender blue-green light from inside on the background of peaks: Sovety, Ozyorniy and Big Almatinskiy during the rest period of the year.